I am about 12 days late on this one, but forgive me. 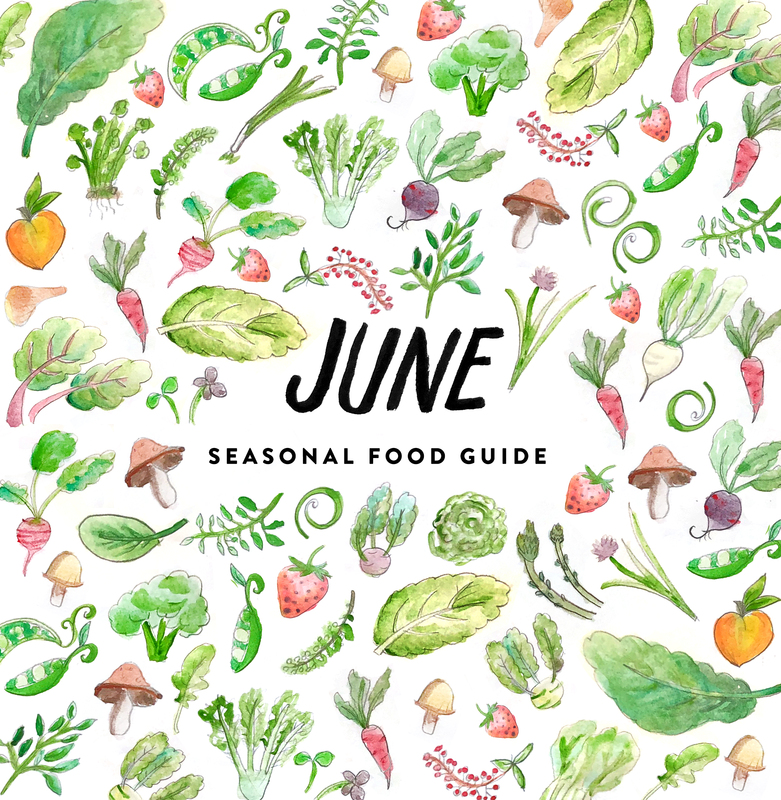 This is our list of in season veggies and fruit for the month of June in the Midwest. Our season ramped up quick this year and some of these things already came and went in a blink of an eye, but some are still yet to arrive, which is very exciting. The best thing to remember about these lists is that there are some factors to consider such as some farmers grow different varieties and things far beyond these. Some don’t grow any of these so your local farms may be slightly different. Also, these lists are intended for the Midwest region which still varies dramatically. Since we are located in Northern Lower Michigan on the West Coast of the state, we have a very different climate than the southern parts or the eastern parts and especially the Upper Peninsula. Everything varies and this just a great general guide. To REALLY know what is in season, go to a local Farmer’s Market. 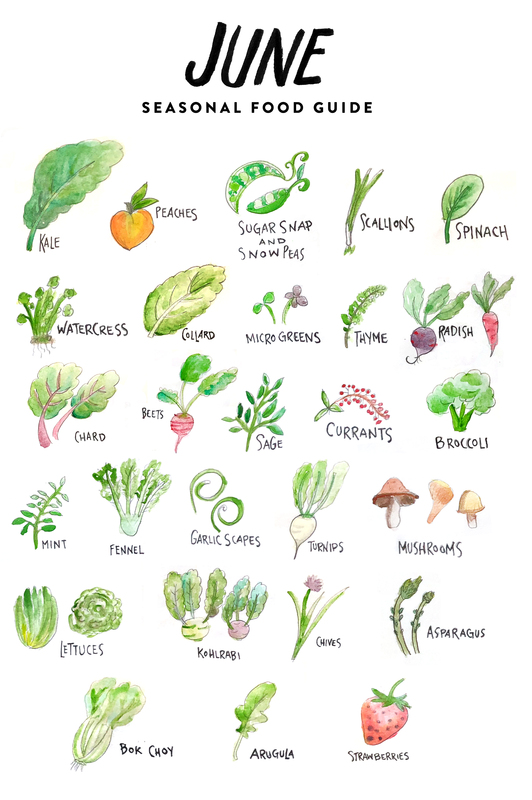 Check out what is in season and what is growing. Always talk with your farmers and get to know their practices and what they will have available that month. The best part of this month by far though is the surfacing of our first round of fruit! Isn’t it exciting to see Strawberries and Peaches! We won’t see these till closer to the end of the month but they are coming and it is always exciting to me when I think about June. So of course this means summer really is here. Other than that, this month entails a ton of greens as well. All are different and contain very different flavors. Find the ones that excite you the most, but always give them a taste in their raw form without dressing first. Those little leaves may just shock you with the flavor they can hold. Good ‘ole kale is an important one to find this month. This time of year Kale is so beautiful and tender. It isn’t as stiff and dense at it gets in the cooler months. This time of year break down the outer layer by taking a good sprinkle of sea salt and a little EVOO and lemon to it. Massage it and serve as an easy side. That’s it! The beautiful little guys they are and they come in all sorts of styles. Enjoy them fresh on the beach or bake them in a crumble or stew them and serve over whipped cream. Enjoy them every way you possibly can and make sure to can or freeze them for those cold winter days. Pea season is upon us! Sugar Snaps are a favorite around these parts (our home with a certain little one) and they are basically like candy. We eat them non stop and enjoy them usually raw, but they are also good grilled or chopped up in a salad. Nothing fancy just keep it simple cause they are so good that way. These flat little beauties are best tossed in a pasta or a stir-fry. Always add them at the end though so they stay nice and crisp. These guys are so great chopped super thin and placed on top of almost anything. The options here are endless so pick some up and eat them on their own or dipped in hummus or just thinly chop and dress any dish with them. I use my spinach mostly in smoothies in the morning with bananas and almond butter, but it also is great in salads or even sauteed. Spinach is classic and FULL of awesome vitamins. Just another awesome green to enjoy raw or sauteed with other veggies. Fun note is that if still has the roots you can place it in water and let it just keep going. All you do it just trim off what you need. Truth be told this is one veggie I hate yet to learn to enjoy. I do see people using them as wraps and I know a lot of people cook them similarly to kale. If you can convince me of a great way to get into these I will but for now I have yet to become a fan. I covered this one in this post, so check that out for what to do with these guys. PS. they are some of my favorite things! A wonderful herb for pasta dishes and with meat. Run your fingers down the twiggy stems and remove the leaves before enjoying. The number of types of radishes is pretty crazy. Most are all available right now and some will linger into July and even in August if we are lucky. The thing with radishes though is that their flavor does change as the season change. You will start getting spicier ones especially if it has heated up a lot and very quickly. So you may never know what you get so always ask your farmer about the flavor. Once again not a huge fan of these guys. I have tried but I am thinking this year we may just ferment them and try them that way, but typically they are sauted or even chopped up and added to pastas. Would love to hear what you love to do with them. These guys are some of my favorites. They are so awesome to grate into slaws or on salads. You can ferment them or quick pickle them. My personal favorite way to eat them though is to peel and then chop them into small pieces and cook them in the oven in water. They are so soft and yummy this way. You can also reuse the beet water for a dressing or to add to a soup even. I have an herb obsession and this one may be one of the most beautiful to me. It is perfect for pastas and cooking in bundles for meat but you can also dry it and make a smudge stick or take the dryied bits and crush them up and store them for cooking all those warm wintery meals that sage pairs wonderfully with. These are one of those ones that doesn’t always pop up for everyone but these guys are really awesome. We paired them this summer peaches. We grilled peach halves and drizzled with caramel and topped it all with the currants. The tart against the sweet was really amazing. Currants have a sharp tart flavor that make for great jam or added into salads. We all grew up this veggie. It was basically a weekly thing to have broccoli on our plates, but who knew it showed up in June. I love broccoli and always have, but not everyone does and I get it, but it has a lot to offer. Chop the florets and roast them till slightly crisped and toss them in a grain salad or add to a regular salad. Then take the stalks and use them for veggie stock. Yes this means it is time to make ALL the mint things. I love mint and use a lot in drinks with or without alcohol and add it into salads. It has such a fresh and light flavor but everyone enjoys it so it usually is a crowd pleaser instantly. Hands down one of my favorite things to see at the market. I love fennel. From quick pickling to shaved into salads. You can also saute or roast it as well. It has anise taste so you have to be ready for that, but if you don’t like black licorice don’t worry! still give this guy a try. The fronds (fluffy sprigs on top) are beautiful and amazing to top dishes. You can treat them just like micro greens. These little guys are so fun. Honestly, treat them just like garlic. You can roast up on the grill or chop them up and place in a salad. My favorite way to handle these guys is peel, chop, and saute the turnips in butter and salt. Then you can add the greens at the end to soften them with it. Mushrooms come in tons of varietals so talk with the farmer about what they are and how to use them. They always know best. Lettuces come in so many shapes and sizes this time of year and they all taste differently from bitter to sweet to buttery. All of them are best for salads but they will be available till summer long. One note is to ask the farmer if it is the first cutting or second cutting. The more regrowing and cutting that is done on the Lettuce the more bitter and worse the flavor becomes. Try to always get lettuces that are no more than the 2nd cutting. The odd alien looking veggie may be one of the most versatile veggies of the season. Get used to using this guy because we will have him around for a while. Make slaw, roast it, toss it into salads shaved, cut it up to serve with hummus for the kids, everything basically goes. Just peel it and enjoy! I live for chive blossoms. Those beautiful little flowers are the crown jewel of the month. THey top every dish in the most beautiful and colorful way. That color purple may be one of my favorites. Enjoy the whole plant from top to bottom. They are that amazing. Yup they are still lingering this month but not very long. Get them in before they are gone. Shaving them is the best way to use them this month as they get denser and thicker now. One of many Asian style greens that pop up this season. Bok Choy is simple and easy, cut it in half and let it cook face down till it slightly carmelizes and serve it just like that with some salt and pepper. Nice little guy to enjoy this time of year with fish or next to a burger instead of a salad. These peppery little greens are amazing. Now, remember how I said to be careful of the number of cuts a farmer has done on your greens, here is another one. The more cuts the more peppery and bitter these become. The first trim is amazing. The second is okay. The reason farmers do this is so they can make more per plant, which I don’t blame them but many times it sacrifices quality in the process. I left the best for last! Get a few bushels and freeze them, make jams, save them for the cold of winter. These guys are the sweet treat of summer and we all just long for them, don’t we? Make sure you get them from someone who hasn’t sprayed and is growing them organically. They may be a little smaller but they are better for you this way. I cannot wait to hear what some of your favorite ways to enjoy this season’s veggies are? Share recipes and your own tips below for everyone to enjoy! Melissa Clark also has a recipe in her cookbook Dinner: Changing the Game, for olive oil braised swiss chard and chickpeas. You infuse tons of garlic in the olive oil first, and then cook some onions along with cumin seeds and red pepper flakes and the chickpeas, and then you add the greens (a ton of them) and cook them way down. Soooooo good with toast, a fried egg, rice, sometimes I add a little sausage…I love chard!! I tried a really good recipe with swiss chard last week-one pot, lemon orecchiette pasta with tomato sauce and swiss chard. cook your pasta, add one can of tomato sauce, season as desired with fresh herbs, add fresh lemon juice and swiss chard, cover so it steams. we sprinkled feta on top or you can go with fresh shaved parmesan.